I’m giving away my startup ideas because I’m focused on building my new startup, YesGraph. We help scale referral recruiting, so if you like this post go try out YesGraph! Applications that open up spare capacity are a big deal. First eBay did it with the spare capacity of stuff in your attic. When counting pro sellers, eBay is the largest employer in the world. Next Airbnb took the spare capacity of your spare bedroom and turned it into the largest hotel in the world. Cars could be next. There are ride sharing services, but they are modeled after Zipcars. That pattern works well for cities where driving is rare. For me, driving is extremely regular: get the kids to school, go to work, get groceries, etc. Getting a Zipcar daily doesn’t make sense, so the car sharing equivalents don’t either. 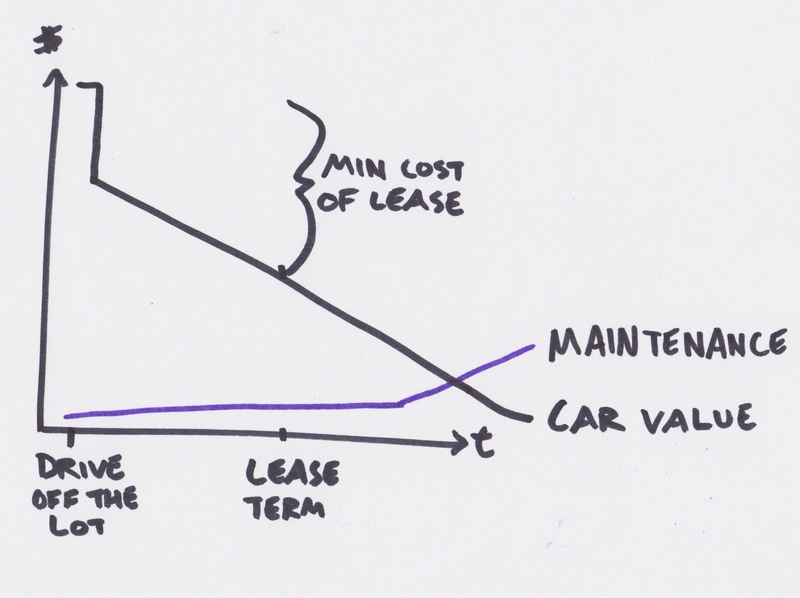 The model that does make sense is leasing, but leasing today stinks. First you have dealerships. Whether buying a new car, buying a used car, selling a used car, or leasing a new car, negotiating stinks, and it takes an actuary to figure out an optimal outcome. Selling a car on Craigslist is really cumbersome too, and Craigslist does nothing to smooth the transaction. The economics of new car leases also stink. When leasing an asset, you need to charge at least as much as depreciation. Cars decrease in value over time, but never faster than when you drive them off the lot. If you ask a dealership why they don’t lease used cars, they’ll say the maintenance is too high. Cars do increase in maintenance cost over time, but this typically ramps up only after significant use. There are a few things to change here to create a better model. 1. Lease Only Early in Life. Cars that are 2-4 years old should be a sweet spot where you can expect relatively low maintenance but the value is depreciating slowly. 2. Keep a Uniform Fleet. Let’s pick a car that would suffice for many commuters: a Honda Civic. Picking an incredibly popular car like the Civic means enough people are pleased and also that the scale bring cost and maintenance efficiencies. 3. Make Leasing Absurdly Easy. I’m not talking about the credit requirements, I’m talking about user experience. Determining whether you qualify for a lease and putting in an order shouldn’t be more complicated than installing an app. There is generally a lack of technology at dealerships, so I think this is one big reason we’re not seeing innovation here. Telsa going straight to consumers and skipping dealers is a movement in the right direction: make the buying experience seamless. 4. Bundle Maintenance & Insurance. If you had a uniform fleet, maintenance could be as easy as dropping off a car, and taking another one home. The lease essentially becomes a subscription to have a car. Even if you don’t go that far, part of decreasing transaction costs is simplifying other purchases like insurance. Being the insurance provider also opens up more opportunities to get efficiency at scale with software because the process today is archaic. For example, you should have GPS tracking connected to an app, because in 2013 my car should know where it is. Users could opt-in to track speeding & location to lower insurance costs. You could encourage safe driving and also resolve claims faster with the black box data. A device to do just this might be a stand-alone startup. 5. Keep Moderate Terms. 3 year leases increase the commitment required to make a lease decision. Making the commitment month to month would make the choice to lease equivalent to buying a monthly train pass. The cost isn’t particularly small, but small enough that you could just try it out. 6. Centralization vs Sharing. This is the main part I haven’t quite figured out. One way to get a uniform fleet is to buy lots of cars yourself. Another way is to only allow certain people to share their cars. The latter allows you to build up a fleet faster and without the capital costs. But with that benefit comes the added cost of making quality control, maintenance, insurance, and leasing terms work when the fleet is distributed. This is all part of lowering transaction costs, so getting to efficiency here matters a lot. One way to proceed with this idea is to partner with a single dealership and run a campaign locally. If it works there, you can justify the capital and development expenditures, whether building your own fleet or making a sharing service. If you’re fundraising for the effort, establish your goal early before running the test, and only come back asking for money when you show it works. The dealership might even give you a customer list to test the other end of the market: contact recent buyers and ask what they think about leasing out their car starting in a year or two. On last note: the main reason I’m not trying this idea is that anything dealing with physical goods kind of scares me. Do you want to start working on this? Do you want to invest in this idea? Do you think this is all absurd? Get in touch: ivan.kirigin@gmail.com. Subscribe to get more new ideas.